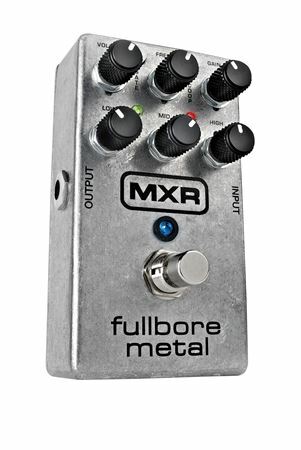 Shop MXR M116 Fullbore Metal Distortion Pedal from AMS with 0% Interest Payment Plans and Free Shipping. MXR M116 Fullbore Metal Distortion Pedal; Blood Pumping Heart Throbbing Distortion that Pushes the Limits! With incredible features including killer controls and compact chassis, the MXR M116 Fullbore Metal Pedal roars onto your rig with pure attitude and intimidation. Volume, Gain, Frequency (with sweepable mid-range) give you the control you need to get the precise distortion tone you've been chasing. With separate Low, Mid and High controls, you can attain incredible control to manipulate your distortion. The Scoop control boosts the Highs and Lows for a more modern metal tone while the onboard noise gate, Gate control gives you power for intense stops and starts by setting the threshold to control the amount of sensitivity of the gate. Love this thing. Just what I was looking for in sound. I would recommend this to anyone who wants some serious metal tones. Very cool pedal, i really like the tone I'm getting from this, using my fender noir telecaster with Seymour Duncan 59 stacked bridge pickup . I've used it to push my blues junior, and also used to record into our home studio as well. I think it's always better to try a pedal before purchasing a new amp. Great quality and tone it works for me. This is one of the best pedals i have ever owned, amazing tone and amazing quality. Well worth the money. I bought this for the purpose of recording a couple of videos. I must mention first, that I'm running it through a solid state Tech 21 Power Engine 60 (a powered speaker with no pre-amp). It sounds good, but it is important to take your time dialing in your sound, using the freq & midrange controls. Brutal pedal. Lots of control. Would buy again if lost or stolen...already did :-) on my 2nd pedal. Yes well made. Very dependable. Heavy-brutal-metal. It can be tamed down or with the gate option and mid scoop sounds very tight and heavy. You can open the back and fine tune the gate option but, sounds good right out of the box..
mXR make good pedals. Stand tall over time. I researched several distortion pedals and settled on this one. I use it for effect as another distortion sound apart from my amp tube distortion. I found it hard to carve out a decent sounding distortion but I,m still experimenting with it. it really focuses on the mids but is hard to get a non scooped sound. Dimebag Darrell tone in a box!!!! I haven't had it but 2 weeks, but it's built really well I don't see having any problems with it as I never did with any of my MXR pedals. You can get so many different sounds out of this pedal. All the controls are very responsive and dynamic. I don't need the noise gate because I have active EMG pickups. I did try out the gate though however to cut off as soon as I palm mute. It works great. You can get very harsh sounds out of this box on solid state amps. I use it on a Bugera V5 tube amp so it's not as harsh. The mid scoop works fine, but I don't really use it. Lots of tone in this pedal. It's easy to dial in a good sound. It works good on dark or bright amps. Buzz saw treble. You can get Pantera 'walk' right out of the box with little effort tweaking it. the finish is the only thing they cut corners on. There's no paint! My 1st one came broke and I had to mail it back. I went with a less known company and tried to save money. All manufacturers have mistakes assembling products. I've put wrong PCB boards in products myself. It happens when you hire new employees till they get the hang of things. Quality built like all mxr products. Like I said distortion is tight and very sizzley dimebagish or fearfactory sounding . I think with a half stack you don't even need the scoop button. On my halfstack it sounds better without the scoop button in. I have a plexi and it has great headroom and takes pedals well. So I know my pedals. For the price its worth trying. The metal muff rules though. Looks cool polished steel and small. Would fit on a pedal board well. Or in your case for practices or gigs. Very useable and sounds decent. Just not for my rig. You may like it though. I use a metal muff and my other guitarist bought my mt-2 and likes it better than the fullbore. I gave him the choice of the two.